I was told that this is a feminist book I should read, one that I would wish existed when I was younger. And I find that it indeed is. I want to get this out of the way: Yes, Frankie could have been a better character overall. Her motivation to do what she did was admirable at first but then it escalated soon after. Frankie became too fixated on this one thing that may or may not be worthy of so much attention. At some point it made me question her thought process. Why does the club need to be taken down? Why not create a different one? And most importantly, is it truly unjust for her boyfriend to be keeping mum about his involvement in a secret society? I mean, yes, it's antiquated and they aren't exactly model citizens. So to a certain degree, I do believe that they needed to be put in their place. But to constantly be reminded of Frankie feeling upset for not being included or in the know became borderline annoying that it was hard to focus on the seriousness of her cause. And her cause IS something to be discussed. I loved the commentary on unwritten societal norms and how women are boxed in gender stereotypes all the time, be it in obvious or subtle ways. It really highlighted what is wrong in the world today. Frankie plotted and pulled off pranks that eventually got the Alabaster community talking albeit only to a certain degree. I really enjoyed those parts of the book because the narrative was so alive and entertaining to no end. The witty, sometimes angry, banter between characters were also a huge factor to my enjoyment. Another reason why I liked this book is how Frankie learned through her romantic relationships. She started out with one that didn't go as far as falling in love, moved on to dating her ultimate crush and feeling quite elated by it, to eventually learning just what to look for in a partner. Her emotional growth is exactly the kind of growth that I frequently look for in young adult books. 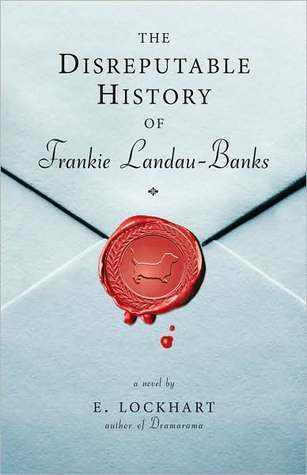 It delighted me to read Frankie because her story resonated with me. I've felt her frustrations in one way or another and I'm sure others have as well. Character faults aside, I can say that there's value in what the story was trying to get across. And I do hope that more people get a hold of this book to receive that message.